RAMAN spectroscopy is being used to monitor biochemical changes and inter-donor variability in stored red blood cell (RBC) units, without the need to open the bags and remove samples. Research into the technique has recently been published in the journal Analyst, by Professors Michael Blades and Robin Turner of the University of British Columbia, Canada. The abstract can be found here (full access is charged for). The group used Raman microspectroscopy (RMS) to study chemical changes in red blood cells during storage in bags. This could eventually be used as a quality check before blood transfusion. An InVia Raman microscope from Renishaw analysed the bulk properties of a sample in two modes – conventional microscopy mode, and with a laser offset using software-controlled beam steering. The laser and collection optics were aligned to implement a spatially-offset Raman spectroscopy (SORS) measurement at a set position, enabling analysis of the blood with minimal interference from the bag material. The researchers have also used Raman microspectroscopy to study single cells and populations of cells in vitro, as they respond to chemical and environmental stimuli including those triggering differentiation, autophagy, necrosis and apoptosis. 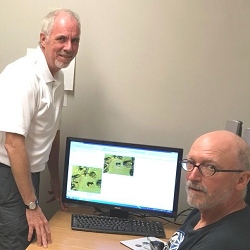 Professor Turner said: “We now have two InVia systems in the lab and both are heavily used – mainly by us, but also by a growing number of external users on a fee-for-use basis.